If you have limited space for a wine cooler but still need something to keep your chosen few stored at the right temperature, then the Igloo 6-Bottle wine cooler would be a great choice for you. With dimensions of 9.9″ (25.20 cm) x 14.7″ (37.29 cm) x 20.3″ (51.49 cm) and weighing only 19.4 lbs (8.80 kg), it’s small and light enough for you to put it virtually anywhere. The Igloo 6-bottle wine cooler features a sleek black design that will fit well in any bar, kitchen, or dining room. It has an upright, vertical design with adjustable height. On the interior, the cooler has chrome wire shelves that are illuminated by a blue colored LED light. It comes with a one-year manufacturer’s warranty. It features a thermoelectric cooling system, which runs quietly and totally vibration free, preventing thousands of micro-vibrations from oxidizing your wines over time and reducing their quality. Its single temperature zone ranges from 50F (10C) – 60F (15C). For such a small appliance, the Igloo 6-bottle wine cooler does a great job, but it does have some cons to go with its pros. First, we’ll run through the positive aspects of owning this cooler. The Igloo 6 bottle wine cooler’s vertical design allows flexibility in your placement options. Since it has an adjustable height, it can make room for bottles that are bigger than standard size. Since this wine chiller is light and compact, it can be portable. Though it’s meant to be left plugged in one place, it could easily be brought on an RV camping trip, or taken to a friend’s house so they can help you choose the right wine for the occasion. 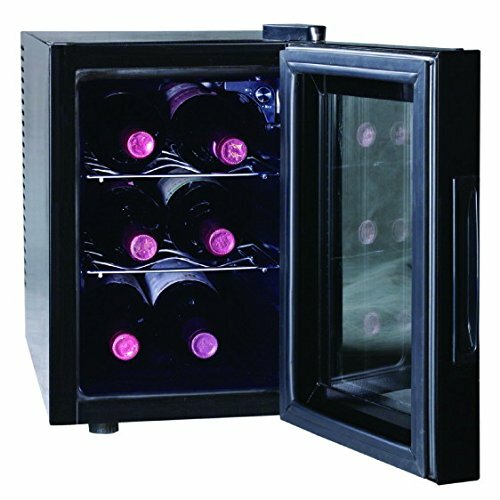 This wine cooler saves on your electric bill compared to some other bigger wine coolers. If you only want to chill a few bottles at a time, why pay the extra amount per month to keep a larger cooler running? The Igloo wine cooler will not disturb your household as it’s relatively quiet. It’s very inexpensive compared to other coolers. At around $60, it doesn’t get much cheaper than that for a fully functional wine cooler. Igloo also offers some larger capacity coolers for very competitive prices. You get your money’s worth from this product with its compact design, portability, quiet and vibration free cooling system and sleek appearance. But just like any other cooler, the Igloo 6-bottle wine cooler also has downsides. Here are some of its disadvantages. The wine cooler’s inner temperatures are affected by the ambient temperature in the room it’s in. If you leave home and turn off the air conditioner on a hot summer day, your wines may warm up until you come home and switch it back on. But if your home’s temperature stays pretty constant, this won’t be a problem for you. The temperature control doesn’t have a display. It would be much more convenient if there was a display screen so that you could know exactly what the temperature is inside your cooler at any given time. This is obviously one of the features that Igloo sacrificed in order to keep production costs down and thus keep the retail price low. An easy fix to this would be to put a small thermometer inside the cooler. It only holds 6 regular wine bottles. If your wine collection is rather small or if you’re really just starting out as a wine enthusiast, this should be just fine. Its size also makes it portable, so this isn’t as much of a con as it is a limitation. This cooler is not exactly characterized by its longevity, but should it have any major issues within the first year, it will still be under warranty. If it doesn’t cool as it should or begins increasing in temperature by itself, has leaks or drips, or any other unlikely defects, you can send it back to Igloo for a replacement. Part of that fact that its price is very low is that the build quality is not quite what it could be. Generally, the Igloo 6-bottle wine cooler is a fine product that should run great and cause no issues. And for around $60, why not give it shot?